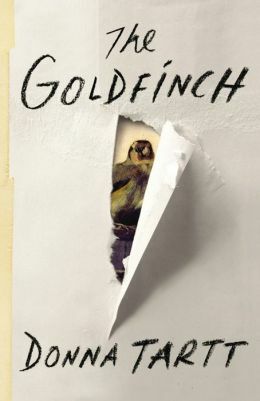 After reading Donna Tartt’s 771 page novel – The Goldfinch – I’m torn between wanting to read it all again and trying to forget it. Maureen Corrigan from NPR calls the story “Dickensian” in her review – Dickensian Ambition and Emotion Make ‘Goldfinch’ Worth the Wait – and following Theo from his precarious childhood to his final words as an enlightened adult does have notes of David Copperfield, but with the modern-day horrors of drugs, alcohol, shady friends, criminals, and shallow wealth. The story revolves around a real 17th century painting (now housed at the Frick Gallery) of a small bird chained to a ledge. Tartt conveniently offers a replica in the book, and the painting as well as the world of art and antiques play important roles in Theo’s life. Theo rescues this painting, a favorite of his mother’s, as he escapes from a terrorist explosion in the museum. Although he survives, his mother dies, and a mysterious old art dealer gives him a ring and a contact before he too dies in the explosion. Throughout the story, Theo manages to keep the painting hidden, and it becomes a source of solace when he can look at it, but eventually art theft, thugs, and greed become part of his adventures. After the death of his mother, Theo’s life bounces from wealthy Park Avenue to seedy Las Vegas and back to New York City, picking up a Russian friend, Boris, along the way – as well as a drug habit that almost ruins his life. Tartt’s supporting cast of characters include villains and do-gooders with long descriptions of their lives and influence. Pippa, Theo’s love interest, bounces in and out of the story, promising a happy ending that would be unrealistic. The drug scenes were agonizingly detailed, and more than I wanted to know; at times, the horrors of Theo’s life were unbearable, yet I kept reading through all 771 pages, appreciating Tartt’s philosophical quips and the convoluted story that kept twisting into another plot. With one random act of violence, thirteen year-old Theo’s life is shattered, and you can’t help wondering what his life would have been like if he and his mother had not decided to run into the museum to get away from a sudden downpour. As the action follows Theo and the painting, you will wonder how either survived but they both do. Tartt ends with Theo’s soliloquy, “Life – whatever else it is – is short…fate is cruel but maybe not random…” In short, make the most of it. If you decide to commit to reading this long book, and it does take a commitment to read 771 pages and struggle through Tartt’s description of Theo wasting himself on drugs, don’t be intimidated by its length. Before you know it, you will be caught up in the adventure and find it hard to put down. In researching Tartt’s writing, I found her acclaimed first novel The Secret History – a murder mystery – now on my list to read. This entry was posted in art, authors, book review, books, mysteries, reading and tagged 17th century art, art mystery, Boris, Donna Tartt, Dutch Masters, European Goldfinch, Flemish art, Harry Potter, Holden Caulfield, Maureen Corrigan, New York City, NPR, Park Avenue, The Goldfinch, Theo. Bookmark the permalink.